Monolithic Dye Solar Cell or monolithic Perovskite Solar Cell assemblies are obtained by stacking titania (anode), zirconia (insulating) and conductive carbon (cathode) layers on a single substrate. 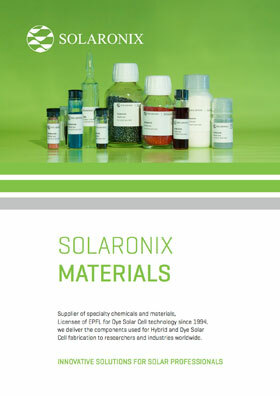 Our products Zr-Nanoxide ZR/SP and Zr-Nanoxide ZT/SP are precisely targeted for the making of such insulating layers in monolithic Dye Solar Cells and monolithic Perovskite Solar Cells respectively. A screen printing zirconium dioxide paste for the deposition of insulating layers in monolithic Dye Solar Cells. Firing the paste at 500°C yields an opaque white layer, that remains porous, with a minimal dye uptake. This allows for titania staining in the presence of an insulating zirconia layer, and offers good electrolyte penetration throughout the entire electrode stack at device assembly. A screen printing zirconium dioxide nanoparticle paste for the deposition of insulating layers in monolithic Perovskite Solar Cells. After firing at 500°C, the oxide particles form a mesoporous coating allowing for perovskite impregnation of the underneath layers. Thanks to a composition exclusively made of nanoparticles, the resulting zirconia layers can be extremely thin, down to the micron, whilst ensuring electrical insulation without sacrificing device thinness and charge extraction. A slot-die coating formulation for the deposition of insulating mesoscopic zirconium dioxide layers.